Kids learn about simple plant classification by "filling the houses"! Similar to "bingo" and "lotto," playing the Intro to Plant Classification Fill-the-House Lotto Game is fun to play, and as a bonus, kids learn interesting science facts and concepts about the plant classification. The twelve classes (house boards) are: Conifers, Fruit Trees, Hardwood Trees, Nut Trees, Shrubs, Annual Flowers, Perennial Flowers, Vine Crops, Root Crops, Grains, Simple Plants and Succulents. 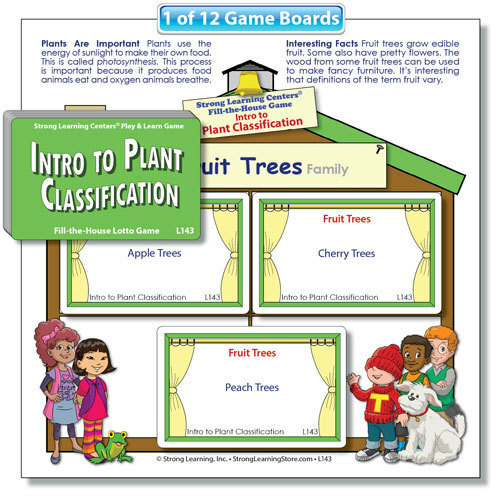 Each board contains interesting facts about plants in general and the plants in the house family.